Apple's dominance in the tablet computing sector seems unlikely to wane in the near future, as a new consumer survey found half of the respondents looking to buy a tablet were planning on getting an iPad, with no other company seeing double digit interest. The Yankee Group recently surveyed 506 consumers, asking them which brand of tablet they intended to buy. Apple's iPad was the tablet of choice for nearly half the respondent pool with 47 percent. Preference for the iPad was nearly seven times larger than Apple's next competitor, Amazon. The results paint a grim picture for the rest of the tablet market. Amazon and Samsung scored seven and six percent, respectively, and no other manufacturer even approached 10 percent. 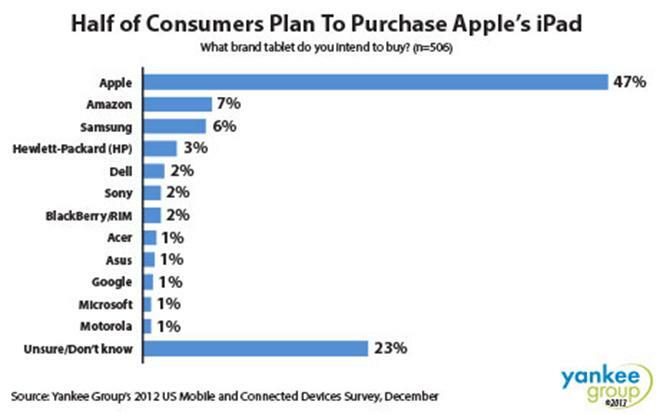 Interest in the iPad was 20 points higher than interest in all other manufacturers combined. The report notes that Samsung plans to make a big push in the tablet segment this year. In February, the company unveiled the Galaxy Note 8.0, a mid-size, stylus-enabled tablet meant to take on Apple's iPad mini. Samsung is aiming at doubling its tablet sales this year, which would amount to roughly 40 million tablets. Introduced in 2010, Apple's iPad jumpstarted the languishing tablet market and has held sway over the segment ever since. Apple CEO Tim Cook views the iPad as the poster child for the post-PC revolution and views the market it dominates as "the mother of all markets." In the years since its introduction, multiple companies have introduced competing devices, but all have fallen far short of the iPad's sales. The most successful competitors have been Amazon's Kindle Fire and the Google/Asus-produced Nexus 7.